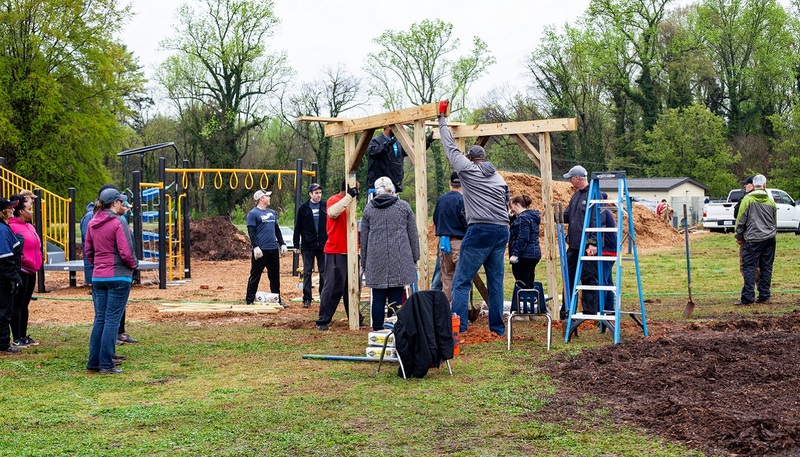 Despite gray clouds and rain showers, hundreds of volunteers were not deterred from building a student-designed playground in one day at Barringer Academic Center in west Charlotte. 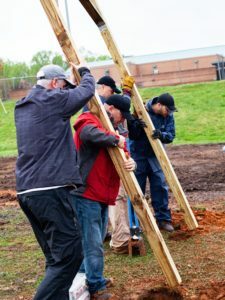 The collaborative hands-on task, along with a dozen smaller projects to benefit the school, was part of the 16th annual Charlotte Playground Build, organized by United Way of Central Carolinas on April 5, 2019. The event helped kick off United Way Volunteer Week, presented to the community by Wells Fargo, April 5-13. Each year, United Way brings together companies across the community for the playground build. These generous partners not only provide funds by sponsoring the build, but also volunteers who make the playground a reality. 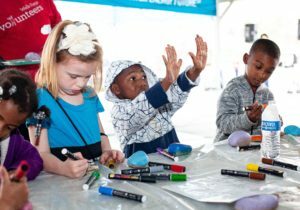 This year, corporate partners contributed nearly $75,000 to fund the playground build and collectively mobilized the largest number of volunteers in the event’s history. In addition to assembling the playground, volunteers cleared brush, refurbished garden beds, spread new mulch, painted movable murals and completed other beautification projects around the school. This year’s playground build was very personal for NagaMallika Manumachu, a Duke Energy volunteer whose daughter attends Barringer Academic Center. Manumachu’s husband volunteered at last year’s playground build at J.H. Gunn Elementary, and she jumped at the opportunity to help at this year’s event. “I knew what a special event this is for the students. It meant the world to my daughter that I was here helping with the build,” she said. Students got to join in the fun by painting hundreds of colorful rocks to be included in the school’s landscaping. Students also entertained volunteers with the school’s song, a speech about volunteerism and a choral performance and surprised volunteers at the end of the day with handwritten thank-you notes. See more photos from this year’s playground build here.